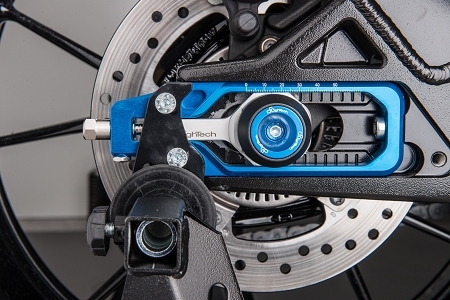 The LighTech Chain Adjusters are great tool for tightening your chain and aligning your rear wheel. 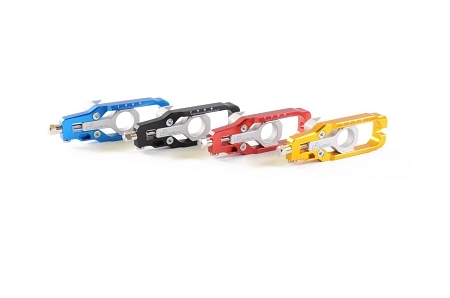 The adjusters replace your stock axle blocks and attach to the motorcycles swing arm. Once you have your rear axle through the adjusters, you simply rotate the end knob to move the axle back or forth causing the chain to tighten or loosen. The chain adjusters have markings on the sides for easy to read measurements and the silver pieces has 2 groves to align with the markings the chain adjuster housings. This is a great tool when you change your rear sprockets at the track. The time to align the chain is reduced tremendously with simplicity.